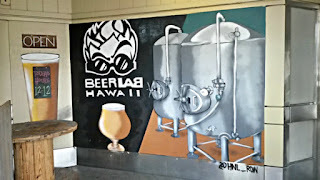 This local craft brewery and tasting room is minutes from the University of Hawaii's Manoa campus. The area has transformed so much since my college days; a wider array of eateries and drinking spots now to keep up with the changing landscape. Beer Lab HI has a constant rotation of taps, usually eight or so of their own brews. 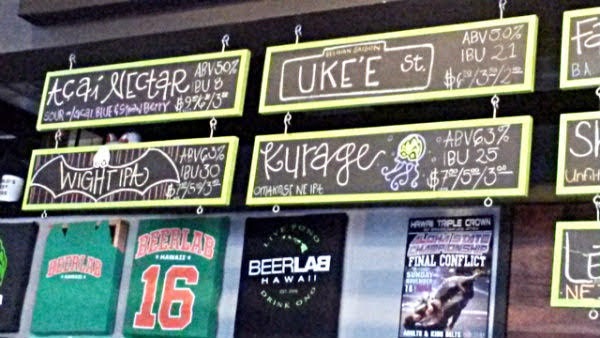 Various styles from sours to IPAs to stouts. 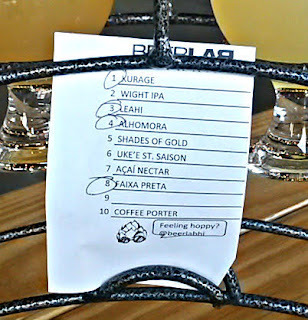 Sizes can range from a 4 oz taster to a 16 oz pint, although the higher ABV beers may top out at 10 or 12 oz pours. 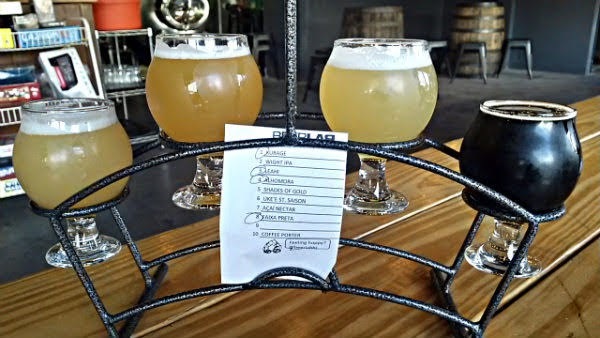 You can get as many 4 oz tasters as you want; but a flight of four tasters fits perfectly in their taster tray. 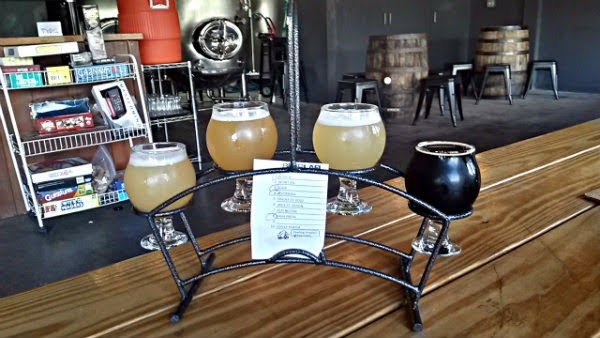 I got a flight of four because science. 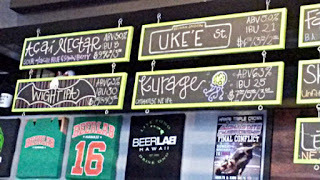 Kurage ($3 taster): 6.3% ABV and 25 IBU. This was my favorite NE-style IPA. Contains Nelson Sauvin and Galaxy hops. It has a hazy pineapple juice color, with lots of tropical citrus and stone fruit. It was the most traditional NE-style IPA of the three. 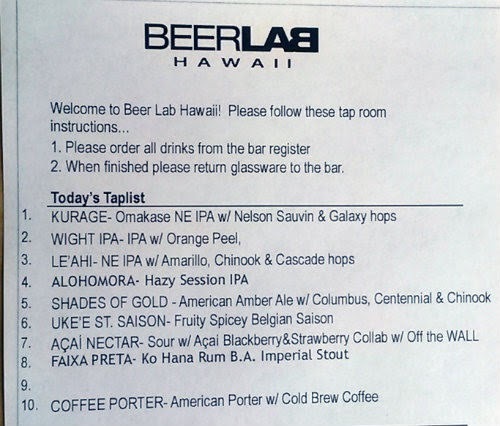 Le'Ahi ($3 taster): This NE-style IPA has Amarillo, Chinook, and Cascade hops. 6.2% ABV with no listed IBU. 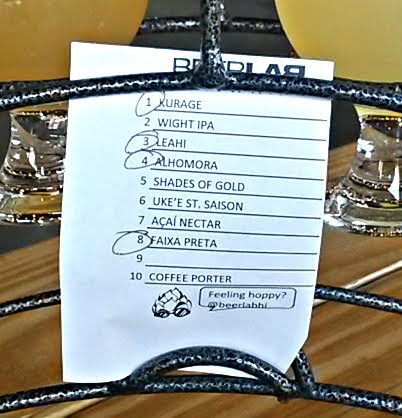 It smelled and tasted more like a Belgian IPA, though (yeasty with a hint of tropical). 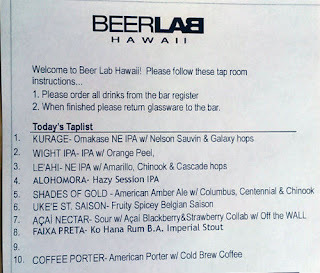 It was OK, but I usually don't prefer those types of IPAs. Alohomora ($2 taster): A hazy session IPA, only clocking in at 4.9% ABV and 12 IBU. More pilsner-like in flavor and a lighter body. Again, just OK for me, but otherwise a well-made beer. Faixa Preta ($3 taster): My favorite of all four tasters. A 14% barrel-aged imperial stout that had Ko Hana Rum in the barrels. Also a 70 IBU beer. The rum barrel flavors worked well with the coffee and chocolate. Roasted malt backbone. Highly recommended. It's also a perfect place to watch your favorite sports game. There are several TVs throughout the building. There is parking in the adjacent parking lot, but otherwise you'd have to find a spot on the street. 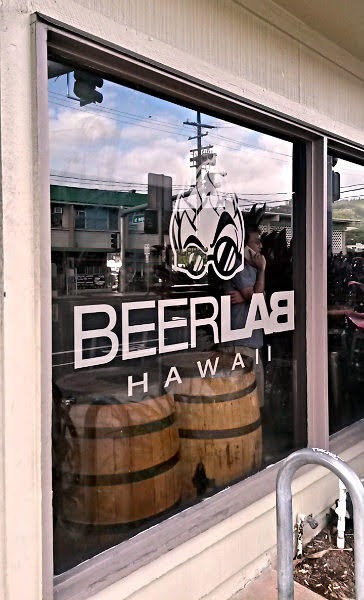 For those wondering, Beer Lab's second location is in Waipahu, towards the west side of the island.